York Vision Care, Meet Sarah Bell, O.D. Dr. Sarah L. Bell, O.D. is our optometrist and contact lens specialist in York, PA. She accepts patients by referral for fitting of specialty contact lens fitting for keratoconus and corneal irregularity, as well as the medical treatment and management of corneal disease. By using specialty contact lenses to rehabilitate a diseased ocular surface, Dr. Bell can provide better vision and better corneal health to patients who suffer a wide array of corneal diseases such as limbal stem cell deficiency, graft vs host disease, corneal scarring and many others. Dr. Bell is a residency trained ocular disease and low vision optometrist, trained at the Lebanon VA Medical Center in Lebanon, PA. She completed her undergraduate studies in Biological Sciences at the University of Delaware and completed her Doctorate of Optometry at the Pennsylvania College of Optometry, graduating with clinical honors in 2012. Her previous clinical experience includes working with the Penn State Hershey Medical Center Ophthalmology Clinic and the Lebanon VA Medical Center. She has trained under Douglas J. Lavenburg, M.D., P.A. in Newark, DE; contact lens specialist Dr. Paul Klein in Fort Lauderdale, FL, the Detroit VA Medical Center, the Optometric Institute and Clinic of Metro Detroit, and the Naval Branch Health Clinic in Groton, CT.
Dr. Bell resides in Lancaster, PA with her husband, Dan, cat, Oliver, and beautiful, healthy baby girl, Ellie Diane. 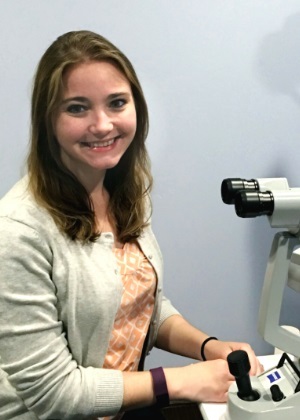 She serves as Secretary for the Lancaster County Optometric Society and volunteers to provide free eye exams through Mission Vision in Lancaster. If you have any questions or would like to schedule an appointment with Dr. Bell please call Contact Lens Specialists of Mid-Atlantic Cornea at 717-855-2604 or request an appointment online. She looks forward to providing you with the personal care you deserve.